If you’ve taken a look at the vast number of products that Nerf has to offer, you may have noticed that some of their blasters can be quite excellent but at the same time, quite expensive. Some of these blasters may not be as affordable for some people and that may deter them from getting their own. There’s no need to fret, however! There are plenty of blasters on the market that are affordable and will pack a punch. 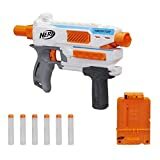 If you’re interested in buying some Nerf guns but you don’t want to break the bank, here is our list of the top 10 really cool cheap Nerf guns. Here you go, my favorite 11 inexpensive Nerf Guns. 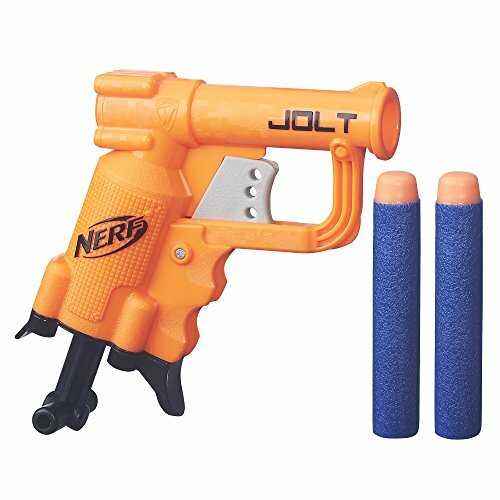 The Nerf N-Strike Elite Jolt Blaster is the perfect option for those who need an affordable Nerf blaster and who also have a young child who is just first being introduced to Nerf. The Nerf N-Strike Elite Jolt Blaster is a single-shooter pistol with a small pull-down mechanism at the bottom of the gun that loads the dart and prepares it to fire. The gun itself packs a punch and is supposed to be able to shoot bullets as far as larger alternatives, although there is no exact measurement listed by the company. It’s extremely lightweight, comes along with two bullets. 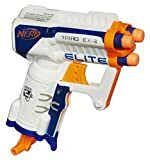 The Nerf N-Strike Elite Triad EX-3 Blaster is the perfect option for those who have older children who still may not be ready for a bigger blaster but who still want to get into Nerf guns. Much like the previous blaster, the Nerf N-Strike Elite Triad EX-3 Blaster is a compact pistol that packs a punch and is able to shoot darts up to 90 feet. However, unlike the previous option, this blaster is capable of holding up to three bullets and shooting each one individually. This blaster also features a pull-down mechanism that is pulled down to shoot each of the bullets, which the gun will detect. This blaster comes with three Elite darts. 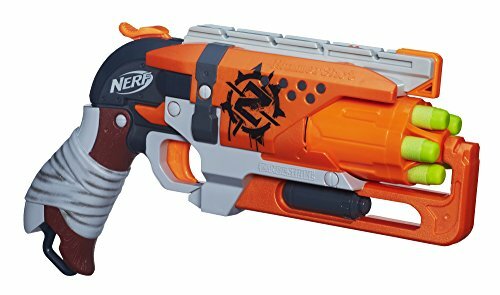 The Nerf Zombie Strike Hammershot Blaster is an easy-to-use blaster that is great for all ages. Housing a five-chamber barrel inside of its post-apocalyptic-themed casing, this gun uses a hammer cocking mechanism that allows you to use only your thumb to prepare your blaster for firing. The great thing about this blaster is that you can use it single-handedly and shoot multiple bullets at a time, making it perfect for Nerf wars and using two guns at once. This pistol comes with five Zombie Strike green darts. 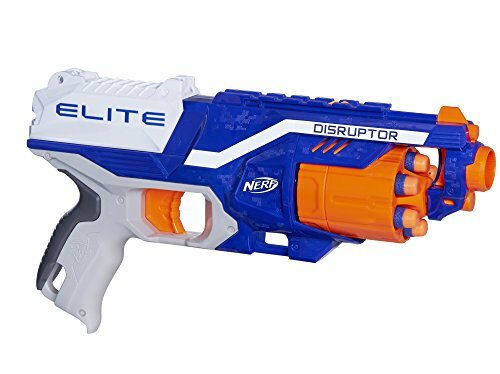 The Nerf N-Strike Elite Disruptor looks different than the standard Nerf pistol and has a six-bullet rotating barrel and a pull-back cocking mechanism that readies the bullet aligned with the sight in the front. The Nerf N-Strike Elite Disruptor comes with six Elite-series bullets. If you’re looking for the coolest and the most affordable Nerf blaster available, look no further than the Nerf N-Strike Elite Firestrike. The Nerf N-Strike Elite Firestrike is a single-shooter gun that is capable of firing a dart up to 75 feet. While that may not sound spectacular in comparison to some of the other blasters on this list, it’s the Firestrike’s additional features that make it stand out. The Firestrike has two amazing features. The first is a precision light beam that is located underneath the barrel and can work on targets up to 15 feet away from the gun. The second feature is the bullet holder underneath the laser, which is capable of housing up to two more bullets that you can load when you run out. 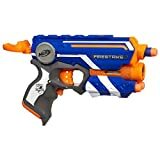 The Nerf N-Strike Elite AccuStrike Series FalconFire is a gun with a stunning design and capabilities similar to that of the previous blaster. This gun is part of the AccuStrike series, which means that is built with accuracy in mind and features a small sight at the top of the gun to help you get the most out of your shots. The bottom portion of the gun also features a dart holder that is capable of holding up to two additional darts. 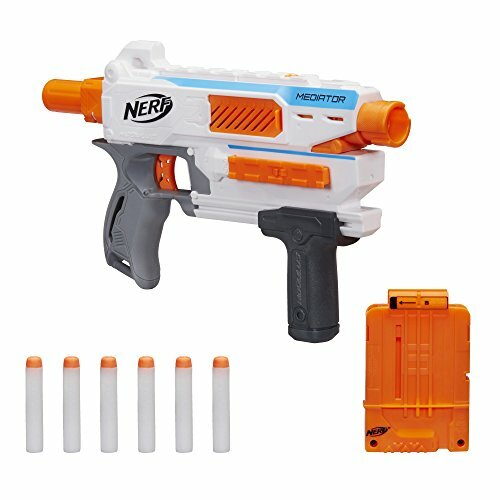 With this blaster, you load the dart in through the top rather than through the front end and the pull-back cocking mechanism helps launch it through the chamber and at your target. This blaster comes with ten AccuStrike darts. If the normal six-shooter Nerf blasters don’t do it for you, this gun certainly will! 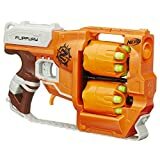 The Nerf Zombie Strike FlipFury Blaster houses two, six-bullet barrels on its extra large body. When you finish with one barrel, you can flip to the next six bullets and fire through those without having to reload your gun. This blaster has a traditional six-shooter build with an extended front end to house the extra rotating barrel. Underneath the trigger of the gun is another orange trigger that allows you to flip through the interchangeable barrels once you have finished going through all of your bullets. This gun uses a pull-back cocking mechanism, comes with 12 Zombie Strike bullets, and sells for around $20, which is a little more of an expensive option on this list but is still quite affordable compared to most Nerf guns. 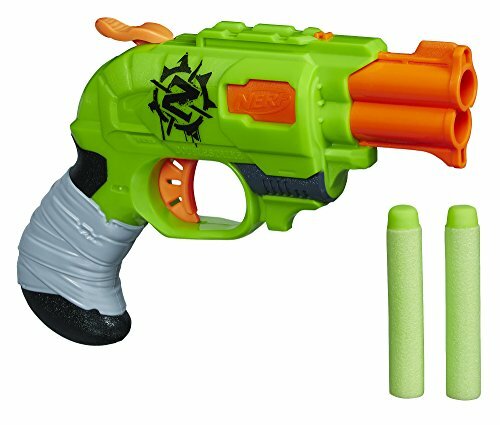 The Nerf Zombie Strike Sidestrike Blaster is another great affordable option coming from the Zombie Strike series. 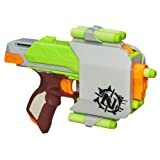 The Nerf Zombie Strike Sidestrike Blaster, while a single-shot gun, comes with a holster that allows you to attach the gun to your belt and hold up to an additional five darts along with the dart that is already loaded in the front end of your gun. This blaster uses a pull-back cocking mechanism. The Nerf Doomlands 2169 Persuader Blaster is a rather unique addition to this list and is one of the lesser known Nerf guns out there that definitely deserves a spot on this list. The Nerf Doomlands 2169 Persuader Blaster is a single-shot blaster. However, unlike other single-shot blasters on this list, this blaster houses four vertical barrels that shoot each bullet one after the other. Along with this special feature, the blaster also uses the hammer cocking mechanism, making it possible to use it with one hand and carry two of these blasters at once. The design of this blaster is also quite unique, with a transparent section in the middle of the gun that shows you what’s going on inside when you’re firing your blaster. This special gun comes with four Doomlands darts. 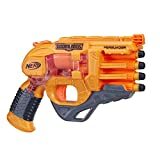 Saving one of the best for last, the Nerf Modulus Mediator is the only one of its kind on this list. Using a pump-action cocking mechanism, users can fire as fast as they can pump, which gives them more control and a quicker shooting time than with blasters that have pull-back or pull-down cocking mechanisms. In addition, rather than having to load the gun with bullets from the front end, the Nerf Modulus Mediator features a clip that can hold up to six bullets at a time. For Nerf users who love to accessorize, this means that all you need is to purchase more clips and bullets in order to keep pumping out bullets during your Nerf wars. The gun itself can also be used to customize larger guns in the Modulus series and is highly customizable on its own. This gun comes with six bullets, a clip, and is sold for around $16. Did you see some products on here that you loved? 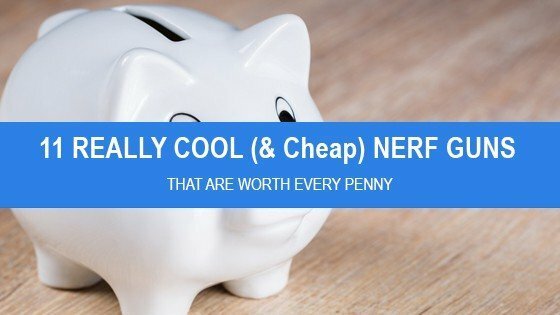 Hopefully this article serves as a tremendous resource that will help you learn more about great cheap Nerf guns on the market and find your own as well! There you have it - a list of 11 nerf guns that are cheap in price but high in quality.